Information about Core Programs offered at La Petite Ecole: Toddler, Pre-school, Pre-K, Kindergarten, and First Grade. This class meets 2 mornings (T/Th), 3 mornings (M/W/F), or 5 mornings a week from 8:30 a.m. until 12:00 p.m., Labor Day through Memorial Day. This class is available for children who will be 2 by March 31, 2020. The Toddlers are socialized through play and learning activities throughout the morning. Like everyone in our programs, they learn songs and have circle time, en français! Toddlers also have daily English only time, in order to benefit from the Dual Language Model. Do not be fooled! Even though the two year old, the youngest students in our programs know a lot! They can count, know the names of the colors and shapes, recognize some letters and name animals and common items in French. Most of all, they are kind to one-another! They say “merci” and “s’il te plaît” when talking to their friends and teachers, and they walk holding hands. So sweet! Note: Children do not need to be potty trained in order to enter the Toddler class. This class meets 5 mornings a week from 8:30 a.m. until 12:00 p.m. , Labor Day through Memorial Day. It is available for children who will be 3 by December 31, 2019 and to children who are already 4. 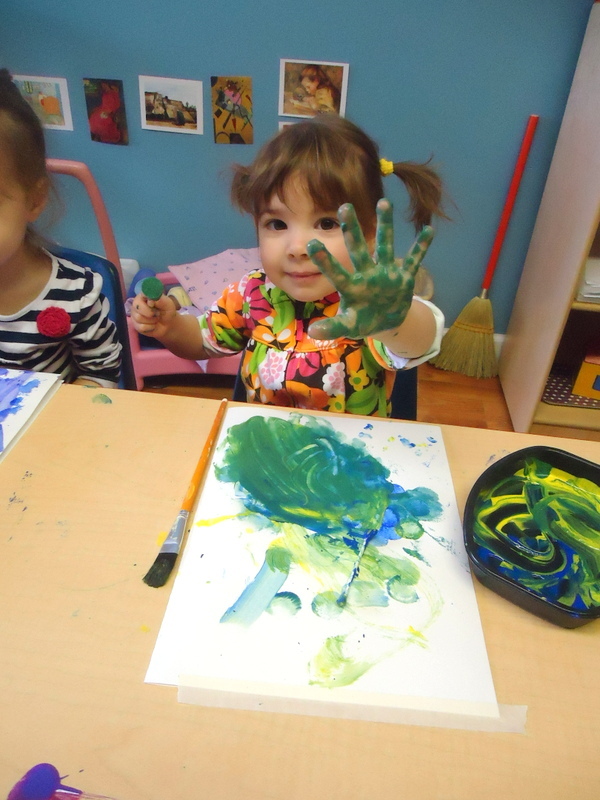 In the Preschool Class, children get daily opportunities to play and develop socially. They learn to write their first name and begin to read! Children can count, do patterns, sort, and some begin to do simple additions. We love to explore the world around us, which is why we go on field trips, such as Peach Tree Farm, where we can interact firsthand with animals. Every day is an opportunity to grow and learn at La Petite Ecole. We do it in French, that is all! Note: Children do not need to be potty trained in order to enter the Preschool class. This class meets 5 mornings a week from 8:30 a.m. until 12:00 p.m., Labor Day through Memorial Day. This class is available for children who will be 4 by September 4, 2019 and to children who are already 5. Your child will engage in academic activities with peers and will develop cognitively and socially in the best immersion environment. At La Petite Ecole, we have mastered the language teaching techniques that will enable your child to grow confident in his/her language speaking abilities. Going to school will always be a joy and as parents, you will be forever pleased that you have provided this amazing educational opportunity for your child. This class is an extension of the school day for students enrolled in the Preschool or Prekindergarten French Immersion classes. It meets 5 days a week from 12:00 p.m. until 3:30 p.m., Labor Day through Memorial Day. The students enrolled in this Dual Language program begin their day in the French Immersion class, most appropriate to their age. After lunch and a short rest period, they will complete the remainder of their school day in an English-only environment. Students enrolled in this program will have the added benefit of, not only both languages, but a longer educational day. French and English Curricular goals will be aligned to maximize the learning opportunities. Note: This class is not available to Toddlers. This class meets 5 days a week from 8:30 a.m. until 3:30 p.m., Labor Day through Memorial Day. This class is available for children who will be 5 by September 4, 2019 and to children who are already 6 for our Kindergarten Class and for children who will be 6 by September 4, 2019, children who are already 7 for our First Grade Class, and children who are already 8 for our Second Grade Class. In this stand alone class, your child will not only learn to read, write, do math, explore his/her creative talents, and be a good friend to his/her classmates, but he/she will also learn to communicate in French! Additionally, your child will have daily English only classes with our English Teacher. Students in Elementary School will have direct instruction in math in both French and English. No previous French experience needed! Young children catch on quickly as they are immersed in the new language, and begin to reap the numerous benefits or early acquisition right away. Our school's unique setting allows for individualized instruction, and fosters the development of friendships that will last a lifetime. Attending kindergarten in a smaller environment requires little transition time between places and activities. Learning time is maximized. Children remain engaged at the highest level, and social disruptions are kept at a minimum. Note: Kindergarten is not mandatory in the State of Missouri. However, most parents choose to begin their child’s formal education by this age. La Petite Ecole is recognized as an accredited school for entrance into Grades One and Two in the Columbia Public Schools, even if your child misses the CPS cut off date.